The Cessna Citation M2 simulator is built by FlightSafety International and is used by FlightSafety to provide training for the Citation M2. FlightSafety was selected by Cessna to build the Citation M2 simulators and provide type rating training for the light jet. 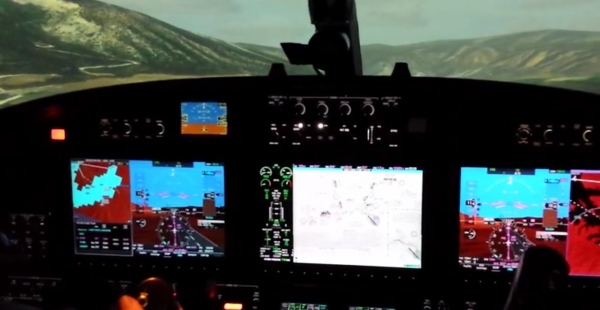 The Cessna Citation M2 simulators built by the company are full motion level D simulators. The company is also the official training provider for the aircraft and it has these simulators on hand. These Cessna Citation M2 simulators are likely located at their San Antonio or Wichita locations. At the end of 2014 the Wichita training location was destroyed after a King Air crashed into the building during an engine failure emergency landing. This likely destroyed many Citation M2 simulators. It is currently unknown if FlightSafety has any simulators in service for the M2. All training for the M2 seems to have been moved to San Antonio because of this. Below is a photo of the inside of the Cessna Citation M2 simulator. The above photo is from a screen capture of Samuel Carmelli's video on Youtube. This video will be posted on our video page soon. Used under the fair use provision. Currently we have not spotted a Citation M2 simulator for a computer simulator program like Flight Simulator X, Prepar3d or X-Plane. If you have created a computer simulator model for the Cessna Citation M2, contact our aviation resources team to get listed here. Also the simulator for this aircraft may be called the Cessna 525 simulator because "525" is the model name of the jet.